Do you suffer with low back pain, neck pain, or carpal tunnel? Do you have a herniated disc, multiple herniated discs, degenerative disc disease, facet syndrome, or any other type of spinal problem? Is your doctor suggesting surgery, pain management, or physical therapy? Have you tried chiropractic and just could not get enough relief? Visit our office and try out the Decompression Traction System (DTS). Since the disc is an avascular structure, it doesn't receive fresh blood and oxygen with every beat of the heart. It requires "diffusion" created by motion and "Decompression" to restore nutrients and enhance healing. Decompression is defined as reduction in pressure (intradiscal). Recumbent positions (both prone and supine) decrease intradiscal pressures in comparison to standing and sitting. However, focused, axial mechanical+Y translation traction, (creating "Decompression" i.e. unloading due to distraction and positioning) has been shown to reduce disc pressure and enhance the healing response even further. There is some suggestion in the literature that extruded nuclear material may be "drawn in" by the reduction of intradiscal pressures. This concept however is not uniformly accepted since the length of time the material stays "drawn in" has not been established in controlled studies. However, temporary reduction in intradiscal pressure can still have a profound effect on the healing process via increased contact with the blood supply and fibroblast migration. This is in addition to the pain relief created neurologically by stretching soft tissue. This makes Decompression Traction Therapy a logical and viable addition to a "passive" pain care regiment. Clinically it is important to establish criteria both in the utilization of Decompression Traction Therapy and in defining its utility. Axial Decompression (both lumbar and cervical) is first and foremost a "passive" therapy ans as such has definite limitations in "curing" a chronic musculoskeletal condition. Its value is most specific in helping referral pain not solely low back or acute low back pain (symptoms for which manipulation has proven beneficial). Loss of local muscle control, abnormal posture, and alterations in spinal curves are the probable underlying source of most spinal 'compression' and degeneration. Therefore, a "passive" therapy has little effect in truly fixing the underlying problem. However, that being said, Decompression Traction Therapy (done safely within established protocols and a clear understanding of its limitations) can often effectively enhance the healing process and render quick, effective and often amazing pain relief in a properly selected patient population (many who have previously failed other treatments). Additionally, it may also ve very useful in determining the overall prognosis of passive care and expediting the phase-in of rehab protocols. Each patient responds differently to treatment and it is impossible to determine how many treatments the patient may actually need. However, a normal treatment plan consists of 15 - 20 sessions, 3 times per week. A trial of 6 visits at 3 times a week for 2 weeks is recommended to see how the patient responds. If the patient has not sustained notable improvement with this trial, continued Decompression traction is not further recommended. If the patient reports modest or significant improvement, continued therapy is indicated. Recommendations to include core exercise and strengthening instruction with our physical therapist is recommended. Examination fees and physical therapy fees are often covered by private insurance companies. Additional physical therapy modalities are available on site to include electric muscle stimulation, moist heat, cryotherapy, ultrasound, etc. A medical visit, chiropractic adjustments, and/or acupuncture visits may also be recommended to enhance the patient's recovery. After your initial examination, you will receive a Review of Findings (ROF) and a Financial Consult (FC) to go over the treatment plan recommended specifically for you. Any non acute (>1 week) low back or neck pain syndrome not related to a disease process, canal stenosis, or acute strain/sprain injury is theoretically treatable by Decompression. 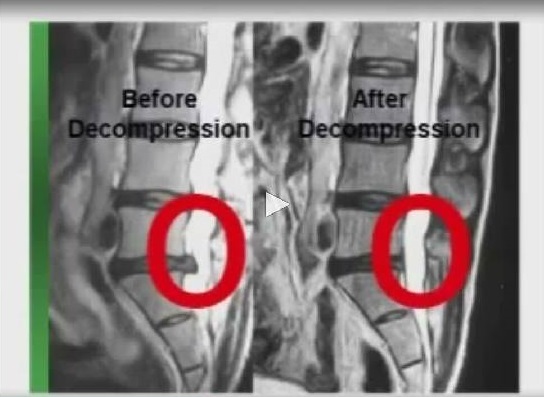 Disc and facet pain can often be relieved by early intervention with Decompression. The acute inflammation of injuries, however, should be reduced by other means, in most cases, prior to beginning Decompression. Contraindications are similar to manipulative therapy, however, since mechanical stretch creates no impact, mild to moderate Osteoporosis may not be contraindicated. This holds true overall for frail and elderly patients who could potentially be injured by manipulative thrusts. Disc fragmentation, calcification, severe arthritis and any surgical appliances are all relative contraindications. Our clinical findings suggest Decompression will create a relatively quick initial response. Patients who will do well tend to feel a sense of relief (which can be direct pain cessation or a centralization of pain and/or reduction to an ache or stiffness) within six sessions. Full relief, if attainable through this passive treatment will usually be in 8-12 sessions. (Occasionally a 'stubborn' pain syndrome may continue to improve slowly over 15+ sessions thoguh this is not the norm.) Often patients will be treated 4-6 sessions and notice enough relief to allow active rehab to begin. Their Decompression may continue (pre or post rehab depending on the methods chosen) for 4-6 further sessions before discontinuing or reducing the frequency. The Spinal Decompression Table, in conjunction with additional modalities, effectively relieves the pain and disability resulting from disc injury and degeneration, by repairing damaged discs and reversing dystrophic changes in nerves. Spinal Disc Decompression addresses the functional and mechanical aspects of discogenic pain and disease through non-surgical Decompression of lumbar intervertebral discs. Studies verify the significant reduction of intradiscal pressures into the negative range, to approximately minus 150 mm/HG, which result in the non-surgical Decompression of the disc and nerve root. Conventional traction has never demonstrated a reduction of intradiscal pressure to negative ranges; on the contrary - many traction devices actually increased intradiscal pressure, most likey due to reflex muscle spasm. The Decompression Table is designed to apply distraction tension to the patient's lumbar spine without eliciting reflex paravertebral muscle contractions. By significantly reducing intradiscal pressure, Decompression Traction promotes retraction of the herniation into the disc and facilitates influx of oxygen, proline and other substrates. The promotion of fibro elastic activity stimulates repair and inhibits leakage of irritant sulphates and carboxylates from the nucleus. The most recent trial sought to correlate clinical success with MRI evidence of disc repair in the annulus, nucleus, facet joint and foramina as a result of treatment and found that reduction of disc herniation ranged between 10% and 90% depending on the number of sessions performed, while annulus patching and healing was evident in all cases. What is Spinal Decompression Traction Therapy? The vacuum effect accomplishes two things. From a mechanical standpoint, disc material that has protruded or herniated outside the normal confines of the disc can be pulled back within the disc by the vacuum created within the disc. Also, the vacuum within the disc stimulates in growth of blood supply, secondarily stimulating a healing response. This results in pain reduction and proper healing a the injured site. There are a number of spinal Decompression machines presently used in the United States. After significant research, our office has chosen to use the KDT (Kennedy Decompression Traction) machine and a Triton DTS machine. Who can benefit from Spinal Decompression Traction Therapy? Spinal Decompression Traction Therapy is usually not recommended for pregnant women, or patients who have severe osteoporosis, severe obesity or severe nerve damage. It is not recommended for patients over 70. However, every patient is evaluated on an individual basis. Spinal surgery with instrumentation (screws and metal plates or "cages") is also contraindicated. Surgery to the discs without fusion or fusion using bony replacement is not contraindicated. Each session includes Decompression Traction Therapy and spinal stabilization exercises and takes about 1 hour. Spinal Decompression is usually performed 3 times a week for 15 - 20 sessions. I have had spinal surgery, but continue to have pain. Can I try Spinal Decompression Traction Therapy? How can I be scheduled for Spinal Decompression Traction Therapy? Simply call our office at 912-427-8433 and tell the receptionist that you are interested in Decompression Traction Therapy. An initial consultation can usually be scheduled within 48 hours. For a FREE no obligation consultation or for more information, please contact Advanced Healthcare and Spine Institute at 912-427-8433 today. Dr. Edwin Davis and Dr. Brett Mizell at Advanced Healthcare and Spine Center in Jesup, GA, are pleased to announce that they are now certified in the Kennedy Decompression Technique. Since there is a high failure rate in disc surgical procedures, the doctors at Advanced Healthcare have decided to take extra effort and seek out the most advanced disc training course to help prevent patients from surgery. The Kennedy Decompression Technique is a very credible, high class decompression certification course which involves 12 hours of online training and 12 hours of hands on decompression training which is approved through the Logan College of Chiropractic. At this certification course, the doctors learned how to properly classify patients into certain categories based upon performing many provocative examinations. Based upon the results found from these examinations, these now certified decompression practitioners can effectively treat disc symptom patients with the highest level of knowledge and expertise. Dr. Davis and Dr. Mizell are the only KDT certified practitioners in Jesup and the surrounding areas. 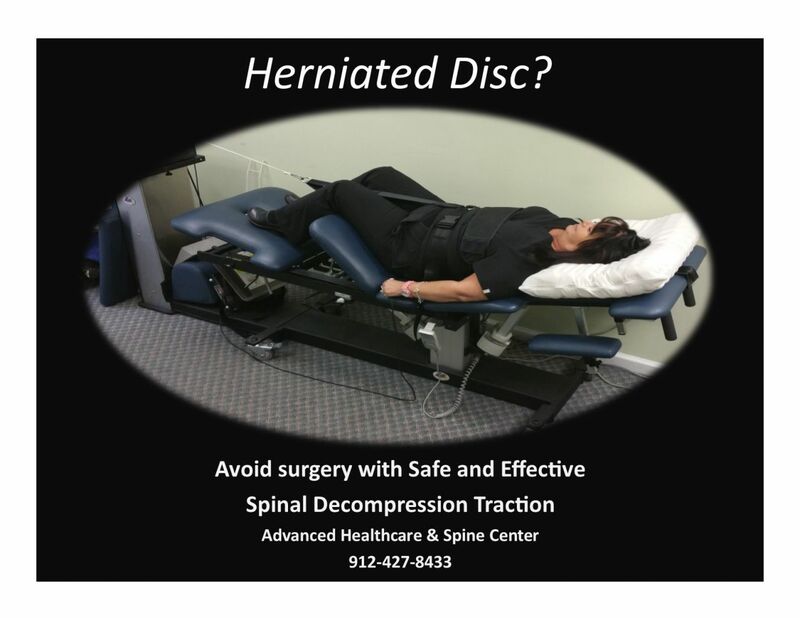 So, if you find yourself suffering from a disc herniation, bulge, degenerative disc disease, sciatic nerve pain, or any type of low back or neck pain, the doctors at Advanced Healthcare and Spine Center in Jesup would like to offer you a FREE consultation today! If you are looking for an experienced, knowledgeable, and credible decompression practitioner, please contact our office at 912-427-8433. We are located at 391 S First St., jesup, Ga.